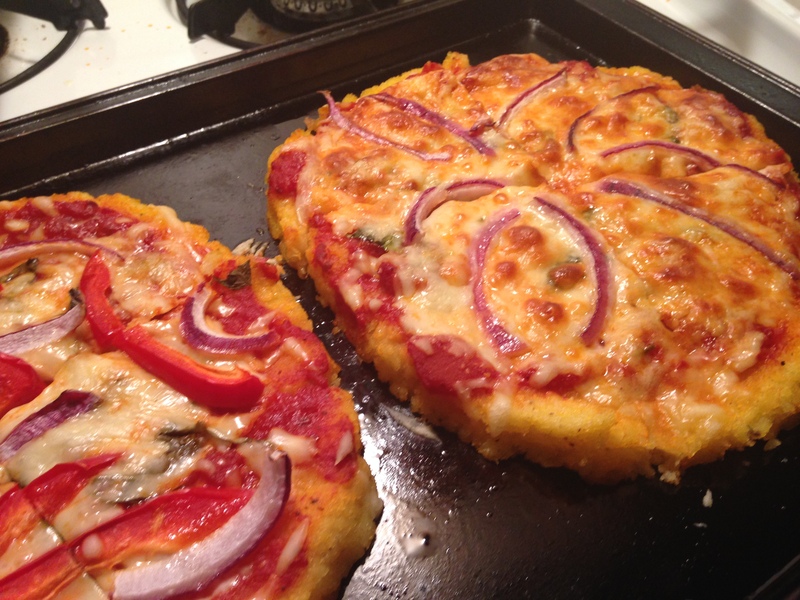 I found this recipe for GF Polenta Crust Pizza on Pinterest and had to try it. This pizza crust hits all my expectations for a gluten-free recipe: delicious, easy and inexpensive. The recipe called for making the polenta dough in the microwave (which was a first for me) and then forming the polenta into crusts and making a basic pizza. 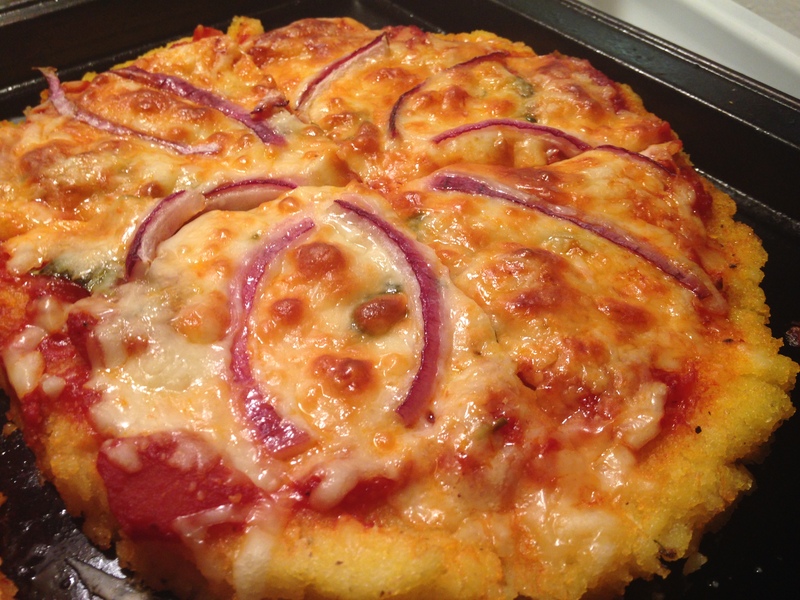 While this didn’t taste exactly like a traditional pizza, it makes a great gluten-free alternative and you will particularly love it if you are a fan of polenta. Be prepared to serve this pizza with a knife and fork, it isn’t as firm as a normal pizza crust. Combine the cornmeal and water in a microwave safe bowl. 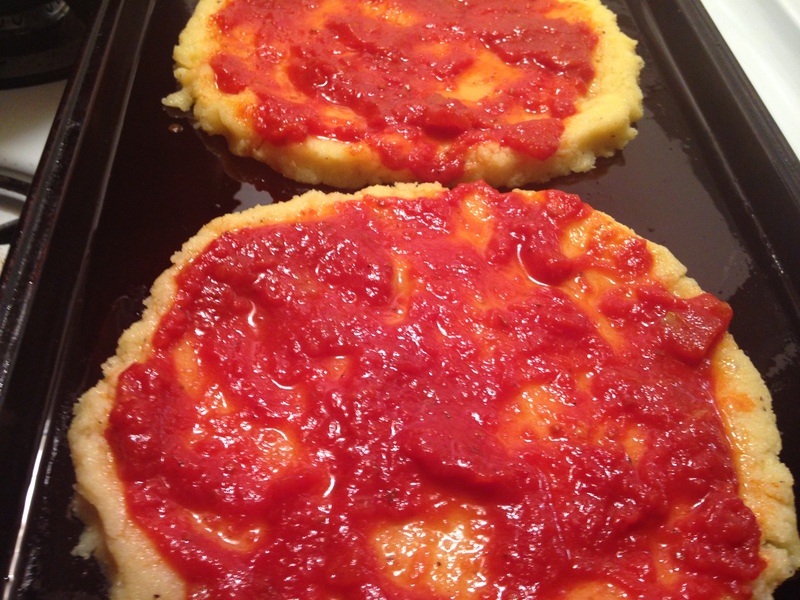 Cook the polenta in the microwave on the highest setting for 5 minute intervals, stirring in between each interval. 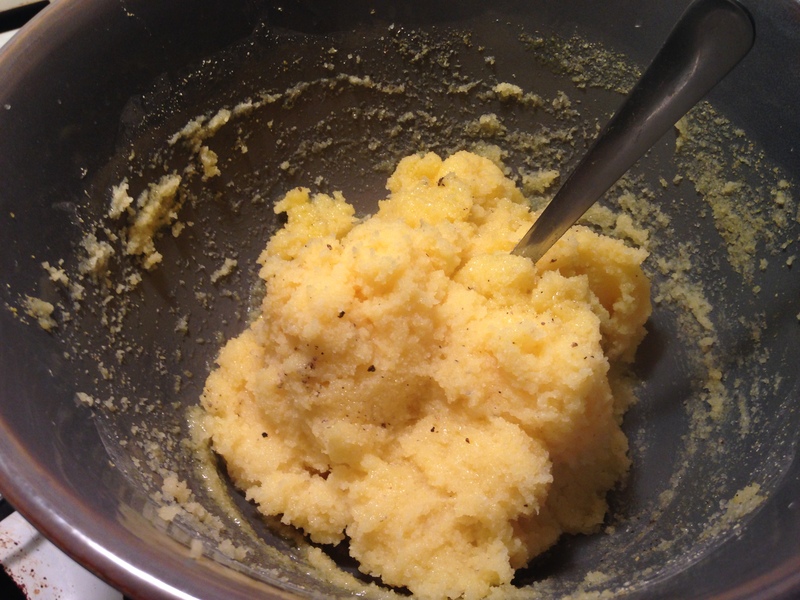 After the second interval (10 minutes) the polenta should be coming together (like in the picture below). 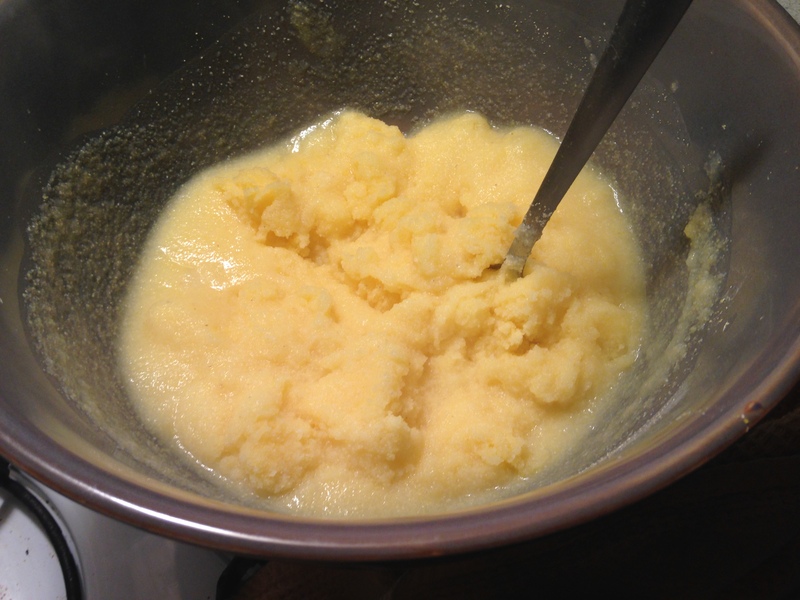 After 10 minutes, place the polenta back in the microwave for up to 5 minutes, stirring it every few minutes. The polenta should be very thick. Once cooked add the olive oil, salt and pepper and combine. 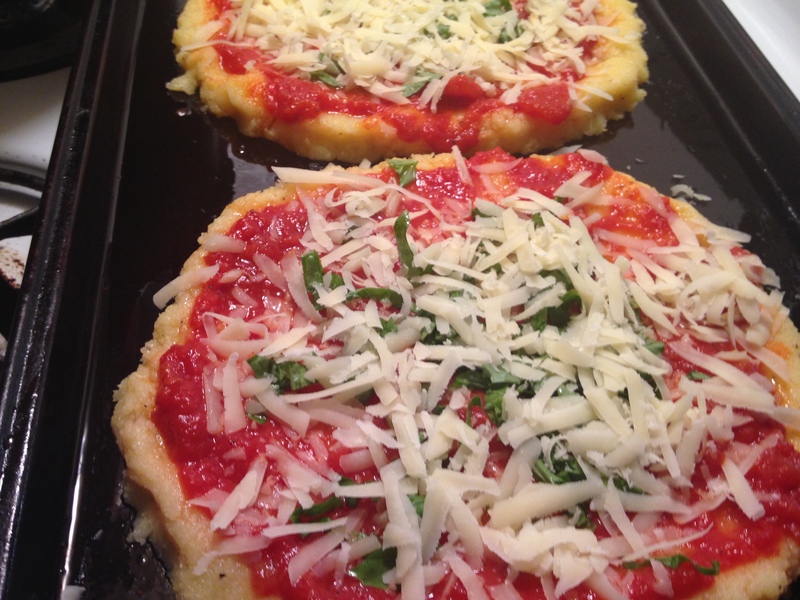 Place dough on a well-greased pizza or baking pan. I made two individual pizzas and there was enough dough to make at least 3. The recipe I followed recommended to make the crust 1/3 inch thick. Place in the oven for 20-25 minutes until it begins to brown in spots (make sure to keep an eye on it). Let it stand for at least 5 minutes before serving. 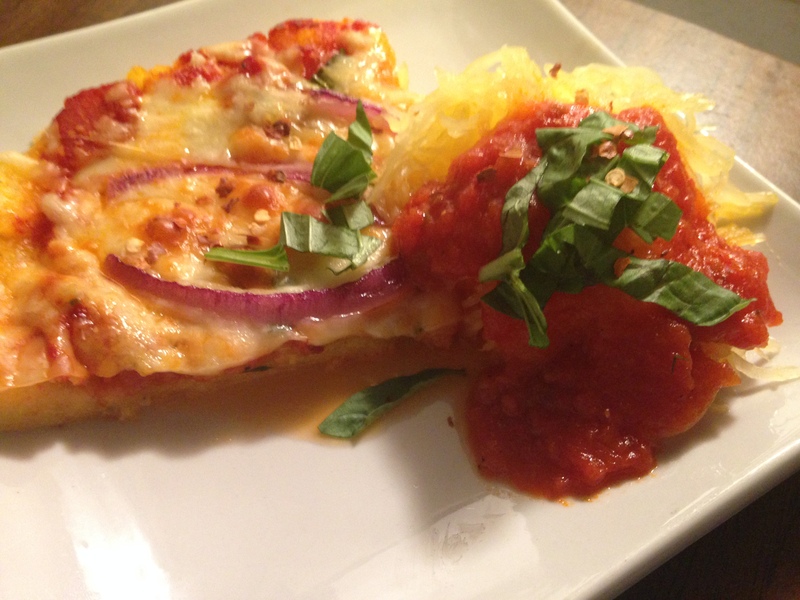 I served mine with spaghetti squash and salad on the side. This looks so delicious. I’m pinning it. I made a wholewheat pizza crust at http://bit.ly/Ho5Why but it didn’t rise or get as thick quite as much as yours looks like it did.